The first rule of ADHD is not to talk about ADHD. You may be aware of this unspoken, super-secret rule, and you may have already broken it several times. However, there are thousands of people who live by this rule out of necessity, out of fear of judgment, and out of fear of reprisal. You may walk past, work with, or study with people that have ADHD and never know it, unless they break the rule and talk about their ADHD. What if someone you know as a good person and seems to do well told you that he or she has ADHD? What would change? How would you then view them? Would you then be more critical of every mistake they ever made and reanalyze your opinion of them? Many people consider the first rule of ADHD to be very important in order to maintain privacy, and to avoid misjudgment. Did you know that many people with ADHD are very hard and successful workers? Some people with ADHD are the most successful entrepreneurs in the world, such as Richard Branson and Charles Schwab. Does that surprise you? 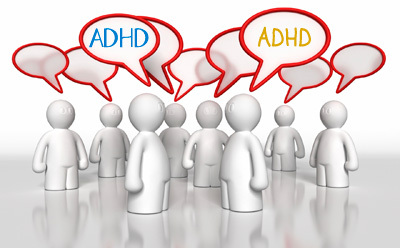 However, when people first hear that someone has ADHD the first thought that they may have is that the person with ADHD will not be very productive, that they will not be successful in any project they undertake or, they will not stick to it. I’ve been writing this blog since 2007 and have written 8 books in that time (print and eBooks) – I think I can say that I have stuck to it. Contrary to popular belief and some news reports, in day-to-day life there are people with ADHD who are the hardest, most diligent producers I know. Just as an example: What if I told you that the most popular single individual blog, which is updated every day, sometimes twice a day, is written by someone with ADHD? Would that surprise you? The problem with keeping the first rule, not to talk about our ADHD, is that we allow news reports to dictate how ADHD is perceived by the general public. If we keep to the first rule, then we allow perceptions from research data and news reports to become our “virtual” reality, because we are not telling our side of the story about how ADHD truly affects each of us individually. That’s why we should change the first rule and talk about our experiences with ADHD. The stigma we live through daily is not always because of our personal ADHD symptoms. Arguably, it is because the information so far shared about ADHD has been overwhelmingly negative, casting all of us in a light of doom, before we can ever prove ourselves with what we can do well. Considering the countless reports about ADHD which seem to claim we have every reason to fail, could you imagine someone with ADHD becoming a Pulitzer Prize winning journalist? Additionally, what if you discovered that her natural ADHD traits actually helped her become successful in her job, and to additionally author 4 books, including one about ADHD. Would that surprise you? “I wrote the book because I realized that I needed to understand a lot more about ADHD than what I knew from the superficial controversies aired in the media if I was going to help my son and myself make the best of our shared diagnosis. Once I delved into the research, and after being thoroughly alarmed by the stats that show what risks we run in life, from drug addiction to being hit by cars in crosswalks, I also found that it’s really not the ADHD that’s the danger, but much more how other people can react to you, and you to yourself, if you’re not careful, and how that can quickly build up to devastated self-esteem. So trying to “cure” ADHD is not the answer. The far better strategy, I believe, is paying a lot of good attention to the kind of environment you’re in, whether you have people in your life to give you love and understanding, and how best you use your gifts and manage the deficits to be a happy, useful and loving person in the world. The thing is that many people do have very severe struggles with ADHD and some of us have been severely punished and reprimanded due to those very same struggles, but sometimes the ultimate battle is overcoming the stigma resulting from all the news reports and research statistics. We absolutely need the research to help us, but let it help us, not hinder us. If we want the truth of our experiences to be shared, we must change and/or break the first rule and that’s up to each person for himself or herself. I can fully understand why anyone would want to keep their ADHD diagnosis low profile. Now, here’s something else to consider: Not everyone with ADHD will be a Pulitzer prize winner and not everyone with ADHD will have a popular blog, much less the most popular, and not everyone with ADHD will be the best entrepreneur earning millions. Those things do not have to be anyone’s goal, but we can all aspire to be something more than what the statistics dictate and it is alright to recognize those with ADHD who have succeeded. Furthermore, just because we have ADHD doesn’t mean we will fail at everything and anything we try, or, that we are predisposed to completely and utterly fail no matter what. Yes, it may seem that way at times, but there’s help out there! ADHD success stories exist and we know that because people have broken the first rule. *Note: In my opinion, there are many people that go out of their way to insure each person is treated with respect as to each individual’s case, whatever that case may be. **Special thanks to Katherine Ellison for her input for this post.